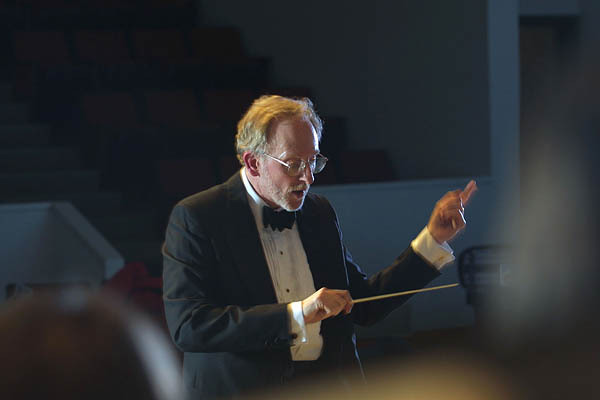 John Corrie conducts the Bates College Choir. The Bates College Choir, conducted by John Corrie, performs Fauré’s Requiem and Lauridsen’s Lux Aeterna at 8 p.m. Friday and Saturday, March 29-30, in the Olin Arts Center Concert Hall, 75 Russell St.
First composed in 1888 and revised a dozen years later, the Fauré Requiem is a setting of the traditional Roman Catholic Mass for the Dead, with the text significantly altered. Today the Requiem is both the best-known piece by this French composer and one of the best-loved treatments of the Mass for the Dead. Lauridsen wrote Lux Aeterna in 1997. A 25-minute work in five movements, it’s a setting for various Latin texts about light. “The piece is often compared to Brahms’ Requiem, also written after the passing of the composer’s mother, but ‘without the 19th-century guilt’ — no Day of Judgment or gloom here, just generosity and radiance throughout,” writes Chicago Chamber Choir Artistic Director Timm Adams.